I don't have a stick blender, so that makes it "Rustic"
See that texture? It's "rustic." And making me hungry. As in, "Rustic Potato Soup." When it comes to cooking, I have a number of solid family-inherited recipes that I use (many posted here) and as I get more adventurous I've begun to add some of my own, like the Chicken Satay. My process for making up new recipes, pretty much always follows the same pattern. I pull out my trusty copy of The Joy of Cooking and see if they have anything similar. I roam over to ye olde internet and look at epicurious.com and then search for recipes on blogs. I write down the ingredients that seem to make sense or overlap from these sources and go shopping. I cook using memory and whatever ingredients I have purchased. And that's pretty much the process. A month or so ago I decided that I needed to try my hand at making soup. Mr. Cleaver makes a lovely chicken/turkey soup/stew whenever we roast a bird, but I had yet to delve into this food category myself. 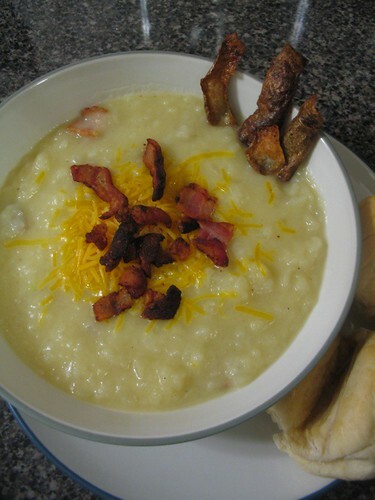 I decided to start with one of my favorites, potato soup. Here's what I came up with, please note that it owes a lot, like a lot a lot to this recipe from Nook & Pantry. I love it when there are so few ingredients, it's like that 5-or-fewer episode of Everyday Food. I also love cooking shows on PBS. In a large stockpot, cook the bacon bits. At this point you can either cook the potato peels in the bacon fat for crunchy potato skins or you can drain the fat. Chop the potatoes into about 1-inch cubes. 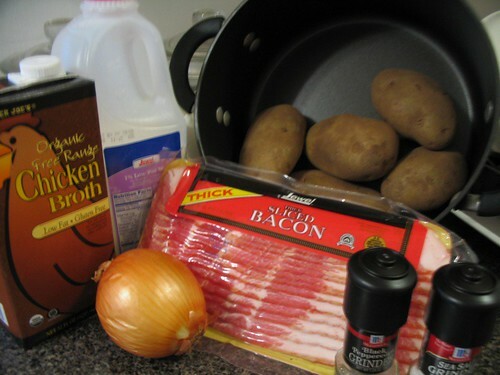 Toss the potatoes, diced onion and half the bacon bits into stockpot and add the chicken broth. Add enough broth so it just covers the potatoes. Boil the potatoes until soft about 6-7 minutes. I usually test the potatoes by sticking a fork into the largest potato piece and if it slides off it's good. Mash the potatoes with a whisk or a potato masher. Add the milk, stir and boil until the soup thickens some. The potatoes are so starchy that it's totally unnecessary to use any thickener (ie flour). Divide into bowl sand top with cheese and remaining bacon bits, or other garnish of choice. This soup is rib-sticking good and Mr. Cleaver-approved!